I’m not a huge fan of American football, but I am a giant fan of Super Bowl munchies and Super Bowl commercials (I loved the NBC promos the best). I managed to cook up THE BEST wings recipe I’ve ever had. Saw Martha make them earlier this week, and I KNEW I had to try them. The wings turned out SOOOOO GOOD. We ate them so fast, I couldn’t even manage a photo of them. This recipe is definitely going into my extensive recipe collection (of 5 or 6 recipes). Hubby is still on sofa-duty after his big knee surgery, and DS#2 was out golfing… so it was very low key at Casa de Zombie for Super Bowlapalooza. Well, I did get a little jacked on some Mountain Dew - and went into sewing over-drive. 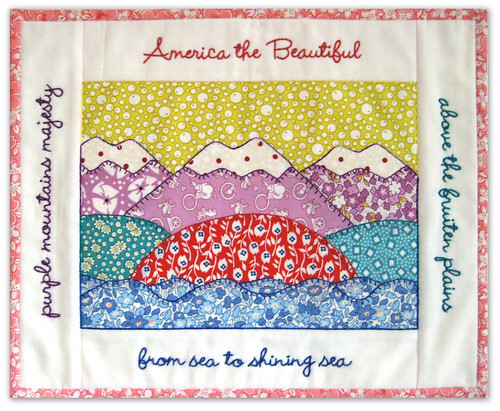 I finished my Inaugural Day “Aquamerica the Beautiful” stitchery that I had posted about here. I made a few mods to the pattern - made it bigger and put the wording on the border. At the last minute, I decided to make one of the fruiten plains red. Red and aqua. I just had to do it. EDITED IN: I just KNEW I should have trusted the red~squiggle~of~doom under the word “fruiten” when I retyped the pattern’s wording. After hearing both Beyoncé and Faith Hill sing it as “fruited”… I knew that THEY couldn’t be wrong - so I googled the lyrics to America the Beautiful, and sure enough… it’s FRUITED! Oh well… the word fruiten has kinda grown on me now. Dude, where’s my fruiten. Fruiten Loops. Fruiten punch. I’ve teased about this project before, and am going to recycle the tease. This is for a Fall 2009 project - but the actual project for the issue is in Aviary by 3 Sisters from Moda. Very cute in Aviary… I wish I could show it, but for now my prototype in my 30’s stash will have to do for a photo. More recycling… my Pennie Pockets have gone green. Well. Pink. And red. But I have recycled the project for Valentine’s Day and for using Moda pre-cuts (Layer Cakes and Honey Buns). My Valentine Pennie Pocket tutorial is here at the Moda Bake Shop. I thought Swell was my all time favorite fabric… but now I’m just as smitten with Sweet (also by the Urban Chicks). Sweet is delivery dated for this month! Don’t you just want to squeeze it!?! 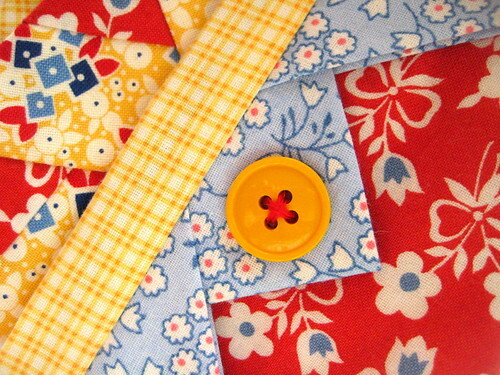 Ga head… give my blog a squeeze while you wait for your local quilt shop or favorite online quilt shop to get Sweet in. If you’re reading this on a laptop… your screen is squishy squeezie. Touch it, you know you want to. I love your Aquamerica! It came out fabulous. I was just at the Moda Bake shop and saw your “Sweet” Pennie Pockets. A little jealous, but I know it will be coming out soon. Hope hubby is up and running in no time. The purple mountain majesties and fruited plains are beautiful. Love that. And love that fabric for the pennie pockets. My hubby has been down too. Hope yours gets better quickly. Ok, so i just had to touch the screen. so glad hubby is snoozin’ and didn’t see that. i’m eagerly awaiting the sweet line (i’ve never been so anxious for a line to come out)i have to admit i have so many plans for both the swell and the sweet line, maybe i’ll redecorate! have a great week! Holy CUTE STUFF, Bat Girl!!!!! You have been a sewing whiz/blur !!!! 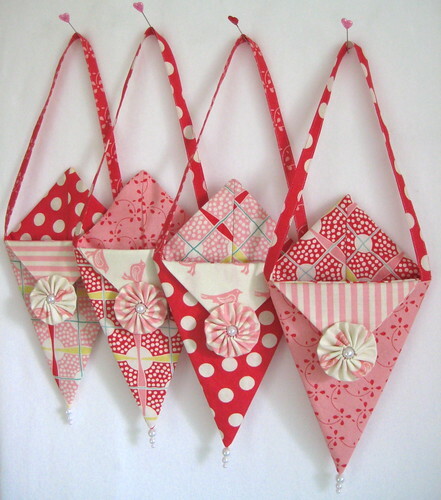 I just LOVE the Valentine version of your Pennie Pockets …. I’m itchin’ to get stitchin’ on some for my kitchen !!! You temptress you…….you are now causing me to go buy a layer cake and hone bun from the Sweet line of Moda!!!!! So darn stinkin cute! Your pennie pockets are adorable. They look fantastic in the Sweet fabrics. Your creative genius just oooozes out through my computer! OMG, I wish you could show a little more of the Quilt and More Quilt, I am literally sitting on the edge of my seat. Come on, pretty please, show us more!!!???? I love your little red fruiten plain. Of course, you are brilliant, Valentine Pennie pocket, fabulous! Love it all! and i SO can’t wait to see the fall o9 quilts & more. Those are so cute! They make me want to call in sick for work today and start to make them right NOW! I won’t, since I work at a hospital, but I’m going to have to make some very very soon! Love the new fabric, too! The striped yo-yo’s are awesome! I love Sweet. I think I may need to get some. 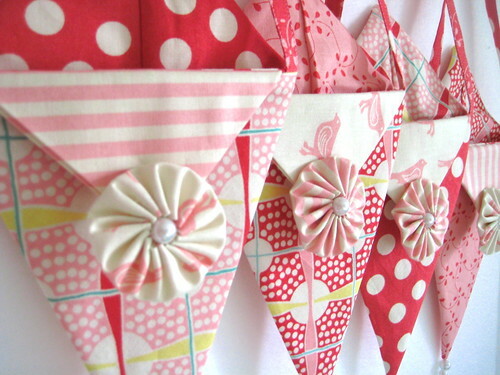 Now I need to make Valentine’s Day Pennie Pockets!!! They are just too cute that I can’t resist! Those could not be any cuter. too beautiful…thanks for the inspiration! I have been lurking on your blog for a little while now - new to this wonderful world of blogging - and I just have to say that I am very inspired by your creativity! LOVE the pennie pockets and the new fabric. Can’t wait to see your new fabric project, either! YaY! Super Bowl Munchies!! Hmmm…I do believe I may have enough SWEET left to craft a pennie pocket of my own! And thanks for the Mountain Dew reminder–that may be what it takes to get stuff done today! Not sure how it’ll react with Day-Quil…but why not find out, right?? LOVE LOVE The Inauguration day quilt! and those teasing fabrics!!! I’m tempted to go off my FABRIC DIET! I say tempted…because if I go look at my stash…I’ll be realistic…and I live in Sweden so tracking down Sweet and Swell would just be too expensive…but a short, quick trip to the UK??? maybe Moda Sweets are there? or? Sweet is just so….well, SWEET! Love it. Look! It’s a post from our little fabric vixen! Is that Sweet the same stuff that you used on your January Snowman BOM? You’re killing me here. Can’t you use any 10 year old ugly fabrics for these cool projects??? I have a stash that must get sucked up! Ohh its just too nice that fabric. I might be “forced” to buy some!! AquaAmerica beautifully designed and wonderfully rich with texture, love it! I laughed so hard at the fruiten bit, I think I spit on my computer screen. I am still giggling like a disturbed person. My husband keeps asking me what is so funny and that makes me laugh even more. Ok….deep breath. OOOHHH we had wings too:) We watched exactly 15 seconds of the game but had to have wings in homage of Superbowl. No one in my household are football fans:) And all fruiten aside, the American sample is beyond gorgeous and now fruiten is my new favorite word:) I love the Valentine pockets - luscious!!!!! Those pink birds are making my hyperventillate. Seriously. Dial 91 and then wait to see if it puts me in full blown attack mode. If I blow a gasket then dial the next 1 for me. Please. This is what happens when I see fabric that I must have. Those darn urban chicks. I’m sending them my ambulance bill. Monica. You are “fruiten” killing me. See it works as a swear word too! Monica, girl, you are wacked! I love your blog, love your projects, and love your sense of humor. I laugh every time I read you. I just wanted to let you know that you’ve been “tagged” by me. You and your blog are now the recipients of the Honest Scrap Award and the Your Blog is Fabulous Award. Please go to my blog and see what you need to do. Thanks for being such an inspiration to me! that is such a great little quilt…fruited, fruiten, who cares…up on the wall no one will ever notice. america is beautiful and i am so glad to be an american!!!!!!!!!!!!! Love the “Aquamerica the Beautiful” block! You should put the fruiten/fruited story on the label somewhere, it makes the block even better!!! You have given me so many things to think about this evening……the word “fruiten” (me thinks me like it muchly), getting “jacked up” on Mountain Dew (I won’t tell you what the guy my son used to work for called it), the fabric lines of “Sweet” and “Aviary”, pennie pockets in red and pink AND the sneaky peeky. My head hurts now! Ah, 3 Sisters - is there nothing they can’t do? (Place Homer Simpson yummy sound here). You are spending MY money, I’ll have you know! I MUST buy fabrics Sweet and Aviary. I love what you’ve been doing! I have been so studying that tutorial for the pockets, but…it looks so complicated to me and I just don’t have that engineer brain! lol! I guess I’m just gonna have to dive right in because I really want something like that for the kids’ teachers for Valentine’s Day! And OMG! The Bake Shop! Wonderful site!!! 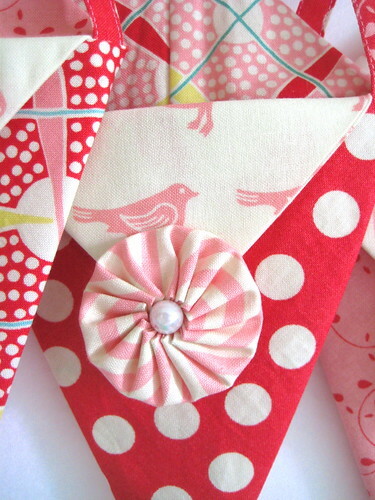 I just called my quilt store and the fabric for your very cute Valentine Pockets are on the way! Dude, that fabric is Sah-WEET! I can’t wait to squish it in person! I love moda bake shop. I am working on a pinwheel quilt from Moda Swanky jelly rolls and turnovers. calorie free. although the cinammon gummi bears I am horking down are not so much free from caloric effect. oh yummy! I spotted this earlier & loved it! I too am a huge fan of swell & can’t wait to get my hands on Sweet! Yeah, yeah, yeah. Pennie Pockets. Been there, done that. ROFLOL! Seriously, though, despite the number of Pennie Pockets I made for Valentine’s Day, every time you do them in some other fabric, I want to make MORE! Easter Pennies. May Day Pennies. FOURTH OF JULY Pennies! But, hey, the REAL thing on my mind: Remember when chicken wings were CHEAP?! I keep thinking I’d like to make some chicken wings, and every time I wander down the chicken wing aisle at the store to see if maybe they’re on sale, OF COURSE they are NOT! Someone needs to breed chickens with more than two wings, don’t you think? i have a killer bbq wing recipe if you are interested, let me know. it’s from the chevy’s cookbook. wings o’ fire. we just made them this past weekend. i love your america the beautiful…. and those pennie pockets make me want to scream. i’ll make some as soon as i can get my hands on that fabric! thanks for sharing your wonderful “stuff” with us monica. Those Pennie Pockets are absolutely adorable! I was searching for Free purse patterns and stumbled onto your poochie bag. Well I am so thrilled! Love what Ive seen. Cant wait to spend some time browsing. Actually I was wanting a little bag for my 2 toddler grandaughters,so I have found it and a bonus–the penni pockets!! So darn cute. Thank you for the patterns!